Three ships, ten planets, thousands of people in danger and millions of meteors between them and you. Rescue as many as possible in a race across the whole solar system and make off with as much salvage as you can in this fun & frantic little home-made sci-fi action-strategy game! 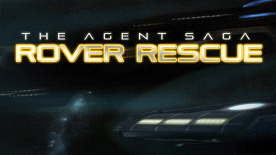 Bringing the line-drawing genre forward, The Agent Saga Rover Rescue adds 3D levels with gravity, power-ups, speed enhancers, commander upgrades and so much more! There’s actually a bit of a story! It all ties together into rest of The Agent Saga. For those that like their Space, the entire menu system is an integrated audio-visual tour of the solar system, integrated fully into the game, with artwork based on real NASA images.